Okay, someone please pinch me!!! 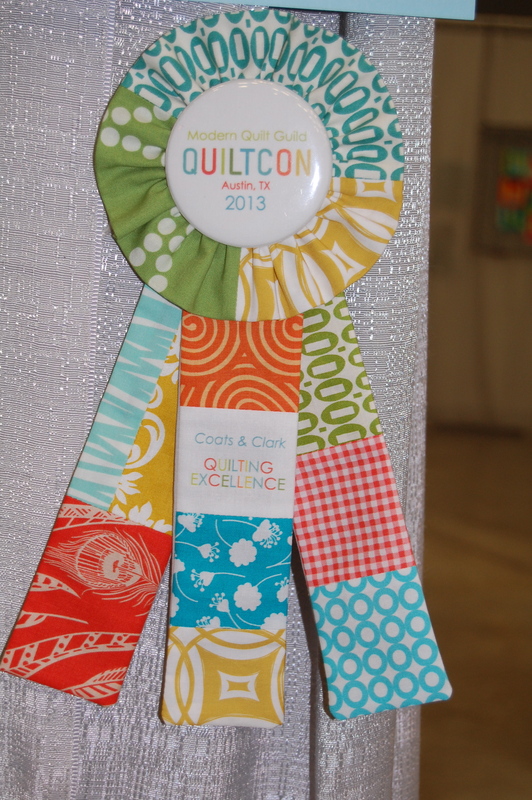 My Sing It Out Loud Quilt won the Coats and Clark Quilting Excellence Award!!! I was completely surprised and honored to have been chosen by the kind folks at Coats & Clark for this Quilting Excellence Award. This quilt was so much fun to quilt, so to be recognized for the quilting was truly gratifying for me. The Coats & Clark brand has been around for almost 200 years and I have fond memories of my sister and I in our handmade dresses from Grandma, that were held together so beautifully by this now iconic brand of thread. Thank you again to Lynn and Coats and Clark for recognizing and appreciating my modern improv quilt. 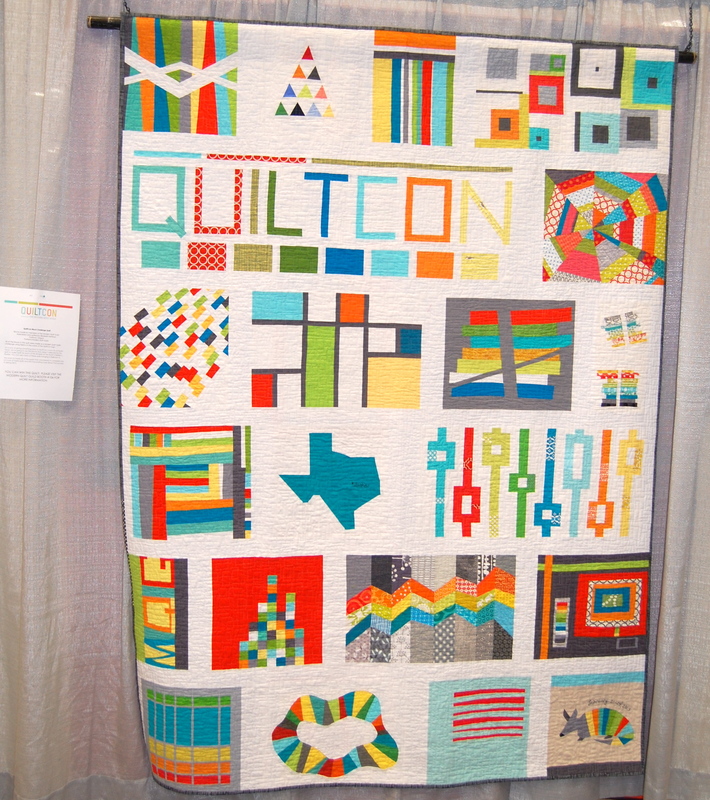 As for the other two winning quilts and quilters…. 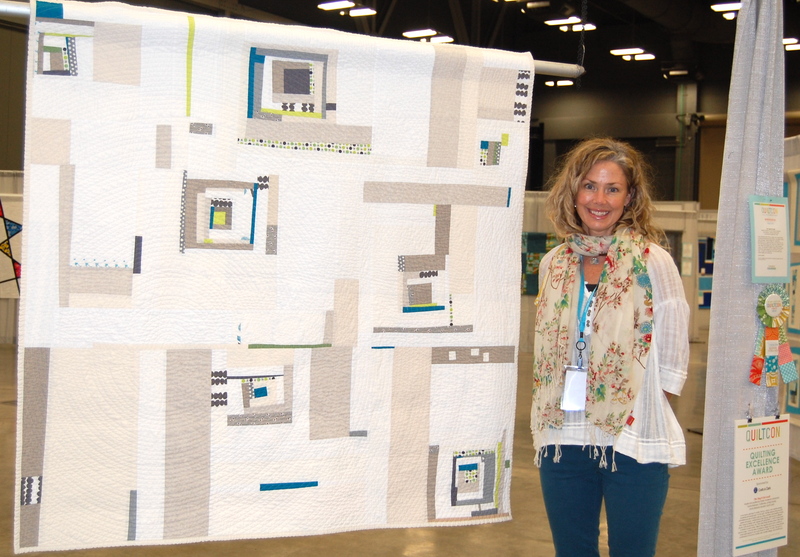 Victoria Findly Wolfe won Best in Show award for her incredible Double Edge Love Quilt. 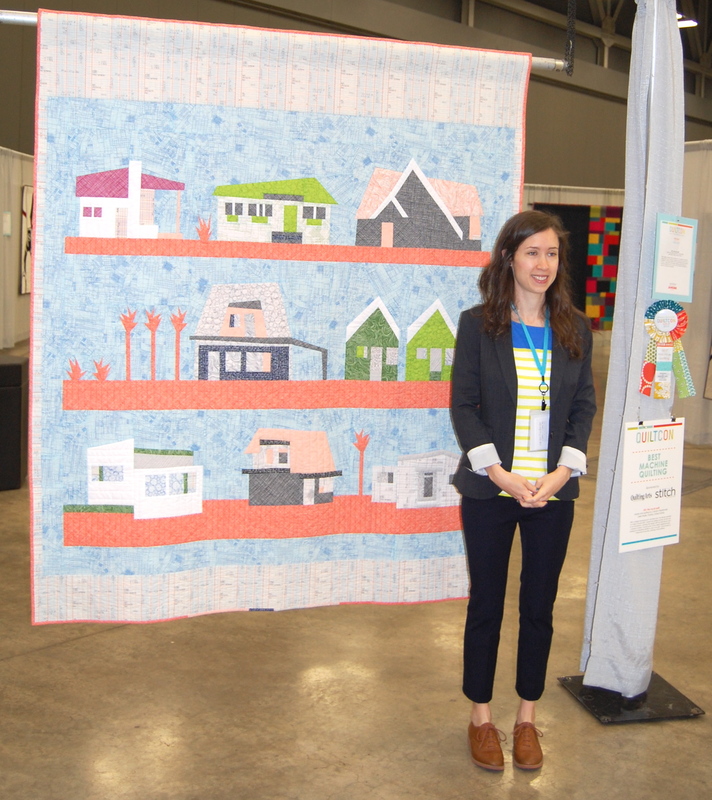 Carolyn Friedlander won Best Machine Quilting award for her amazing The Local Quilt. 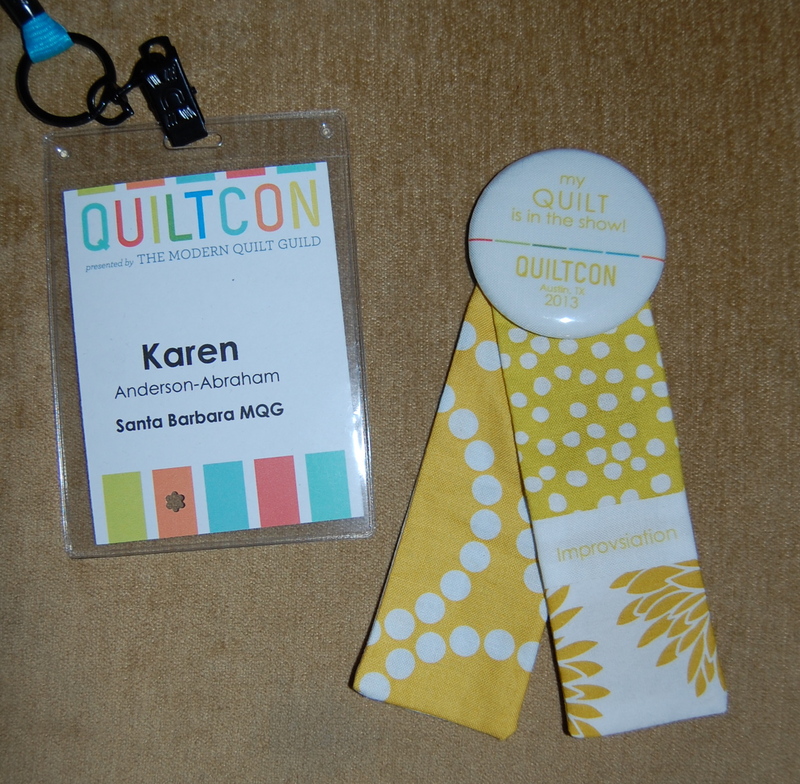 Indeed, Quilt Con was amazing in so many ways! I mean just check out this one small example of the level of detail involved. I spent three days enjoying the workshops, lectures and more amazing quilts in one room, and actually even more (MQG Charity Quilts) in the adjoining room, than I ever could have imagined!! The level of creativity and quilty “greatness” that was displayed at the show was frankly quite staggering. I can’t possibly begin to convey here, just how fabulous this event was. Although I took a ton of photos, there are a hundred more that I wish I would have taken to attempt to document this event. 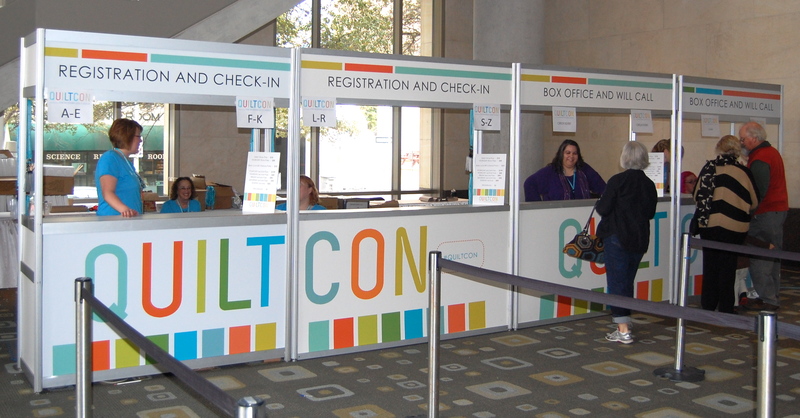 The coordinators (Modern Quilt Guild Board of Directors), and all the lovely volunteers really outdid themselves. Just look at this quilt that was pieced together using some of the best of the best charity blocks from Modern Quilt Quilds all over the world. Keeping my fingers crossed to possibly win this beauty with these great Quilt Con colors!! My hope is to post again to tell you about the great lectures and my two awesome workshops with Jacquie and Lotta. I’d also love to show you some of favorite quilts from the show. In the meantime, if you don’t already know, Christa Quilts has photos of the quilts that won awards at the show. It will take me a bit of time to process the last few days. But wow, I’m just really inspired and excited about the direction of Modern Quilting. It was so much fun to hear my sweet littl four year old say to me when I got home last night, “Mommy, your quilts are rockin'”! Yes, she’s my biggest fan!! Congrats big time!!!! A wonderful honor to be recognized for the great quilting you always do. Yay!! I was so happy when I saw Superbuzzy’s photo on Facebook, so I had to share it with our MQG! Congrats on a really great honor! Looking forward to hearing about everyone’s experiences. So proud of you!! Beautiful quilt. Beautiful Karen. Congratulations! What an incredible honor-well deserved. Congratulations, Karen! It is an honor well deserved. As you can see, your daughter is not the only one who thinks your quilts are rockin! Enjoy the recognition for a job well done! Congratulations!!!!! Your quilt is definitely one of my all time favorites, it’s so perfectly unique. Love the quilting too, of course. I am so disappointed we didn’t get to meet. You know how hectic it was and I saw you a few times as I was rushing to a class but couldn’t stop. Your quilt looked wonderful and hopefully we’ll meet at the next one or another fun quilty event. Congratulations! Karen, thats fantastic news! i was just thrilled as soon as i saw this on the MQG website. Congratulations on your beautiful quilt.